A 24-year-old Marine from Chicago’s Beverly neighborhood has been killed in Afghanistan. Cpl. Conner Lowry, a gunner on a Humvee, was killed Thursday while conducting combat operations in Helmand province, the U.S. Department of Defense said. The death is under investigation. Signs of Conner Lowry’s military service are clear at his Beverly neighborhood. Sadly, so are the signs that he won’t be coming home. “I was always just in denial that my brother would ever be killed over there. I didn’t think it would actually happen to him,” Grace Lavin, Conner’s sister, told CBS 2’s Mai Martinez on Friday. Thursday afternoon, Conner’s family got the visit they feared most. 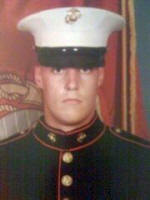 Three Marines explained that Conner had been killed, but offered little detail. Grace says Conner was always looking out for her and others. “He always wanted to serve others, so that’s why he served our country,” she says.